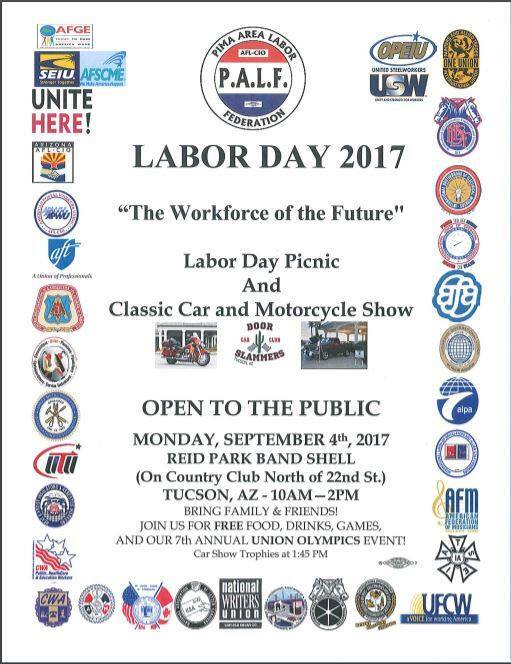 “PALF’s FREE Labor Day event. Pinatas are in the house as well as ingredients for the Peanut in the Pie contest. New this year is the JTED Student Choice award for the Classic Car and Motorcycle Show. Lots of Dem activists and labor booths at this festival today. Gubernatorial Dem candidate Steve Farley, Green Party candidate for Ward 6 Mike Cease, and Independent Gary Watson for Ward 3, all present. Events were the usual sack race for kids, hula hoop contest for all ages, then the popular and rigorous tug of war with long ropes. Too hot to stay to hear the speeches from Supervisors Richard Elias, Sharon Bronson, Bruce Wheeler, other candidates for 2018 offices.